One of the wonderful things about Christmas is the fact that there are lots of chances to cook up delicious meals and food gifts for friends and family. Some people will have started their Christmas preparation months ago baking Christmas cakes which are now slowly being ‘fed’ brandy or whisky to make them extra moist and tasty ahead of being decorated. I’m not quite that organised although I have ear marked some of my chutneys, pickles, fruit vodkas and vinegars as gifts and I’m planning on making lavender shortbreads and perhaps cheese biscuits too. The fruit is now soaking in whisky ready to make the cakes and I think I might try my hand at some home cured gravadlax. For lots of people the big decision is what meat to have for the Christmas meal, should it be turkey or the supposedly more traditional goose, a classic English roast beef or perhaps a stuffed loin of pork. For me though it’s all about the trimmings and the other meals, the roast is almost irrelevant. I’ve often joked that you could easily serve me a plate piled with all the trimmings and I wouldn’t notice if the roast meat was missing. I just love the extras so much and they are the things that most of us only decide to do for Christmas…..stuffings, bread sauce, fruit jelly, sausages wrapped in bacon, about 5 types of vegetables all with little twists, proper gravy made from real stock, tons of crispy roast potatoes…we might do some of these some of the time but we almost never do so many together and of course that’s just the ‘main’ course…there will be a starter when perhaps normally there wouldn’t, there’ll be dessert and mince pies and cake and then somewhere in all this there’ll be a groaning table of cold cuts, pates, pork pies, cheeses, breads, smoked salmon following by an array of cheesecake, trifle, gooey chocolate cake…and lots of citrus fruit too to balance it all out. My particular favourites are homemade mince pies with proper crumbly delicate pastry, baked ham, the sausages wrapped in bacon, roasted root vegetables, braised cabbage with lardons and a splash of white wine, chestnuts tossed with Brussels sprouts and butter, super crispy roast potatoes. Give me those over the festive period and I’ll be happy but there is one thing that that I wouldn’t ever go without at Christmas regardless of what else I chose to cook and that’s chestnut stuffing. Even if I’m not having turkey or chicken or pork I still make some in a sort of terrine style and eat it with chutney or pickle or as a sandwich filling. I love it, it’s the stuffing we always had at Christmas when I was growing up, so it’s a Christmas must (the recipe is from my Grandma). 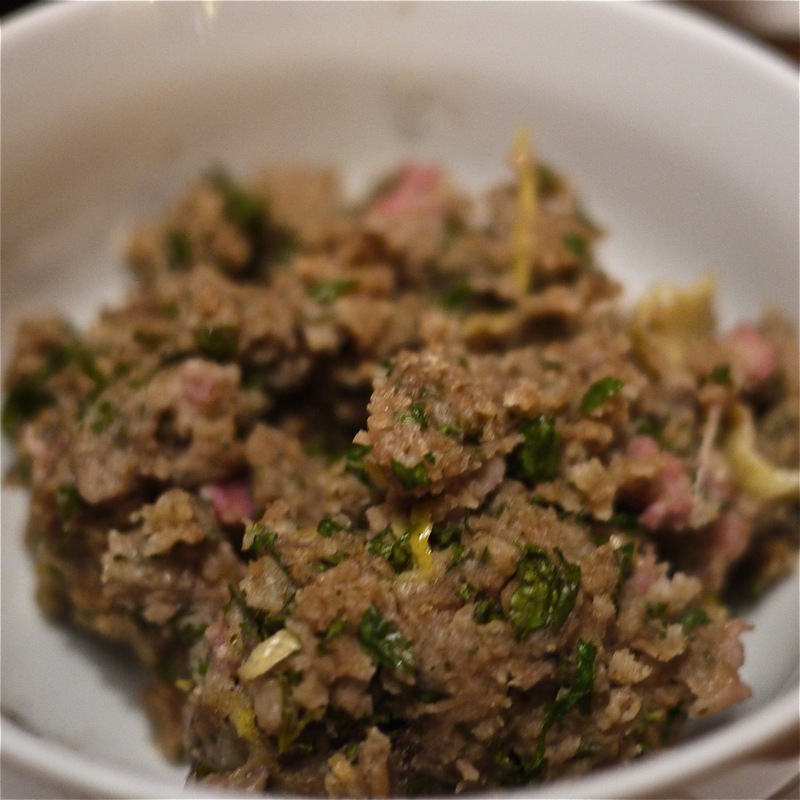 Its tasty and moist without being heavy, lots of stuffing’s use pork mince, which makes them very rich. This is simpler and with a little adaptation could easily be made into a fantastic vegetarian version as a terrine. I really like chestnuts, their sweet mealiness lends itself well to a range of different dishes, savoury and sweet. They are good in wintery stews particularly with game. They are delicious roasted and eaten straight from the skins. And they work in cakes and breads, particularly with chocolate but they also have a long heritage as a flour substitute in southern Europe. When I was doing a trial batch of the stuffing last week for this blog post I also decided to play around with some other chestnut ideas so as well as a stuffing I think everyone will like, for chestnut fans I’ve a chestnut jam recipe and also a chocolate and chestnut cake. So stop worrying about whether to have turkey, goose or beef, focus on the extras and I’ll bet almost no one notices which roast you serve. The way I like to cook means this recipe is just a starting point, pick your favourite herbs to go in the mix, don’t use bacon if you want a vegetarian version and perhaps add gently softened onions instead (or even as well if you like). Break up the chestnut puree with a fork; add all the ingredients except the eggs and mix. Once mixed add the egg and bring together. Use to stuff turkey, chicken or loin of pork. Bake any you can’t fit in the meat in a dish or terrine. You can line this with streaky bacon and fold over the top or simply dot the top with butter. Cook the extra stuffing for at least 40 mins at R6 (200C), you may need to cover the top with foil half way through the cooking time. Put the chestnuts in a pan and add the water, the lemon zest and the vanilla, simmer gently for 30 mins (covered) to allow the flavours to infuse. Drain but retain the liquid and top back up to the 75ml per 100g weight of chestnuts using either water or brandy. Push the chestnuts through a fine sieve then add back to the liquid. Bring to the boil and simmer until thick and when a drop is put on a cold plate in the fridge for a few minutes it forms a skin and is a jam consistency. Put in warm sterilised jars and seal. 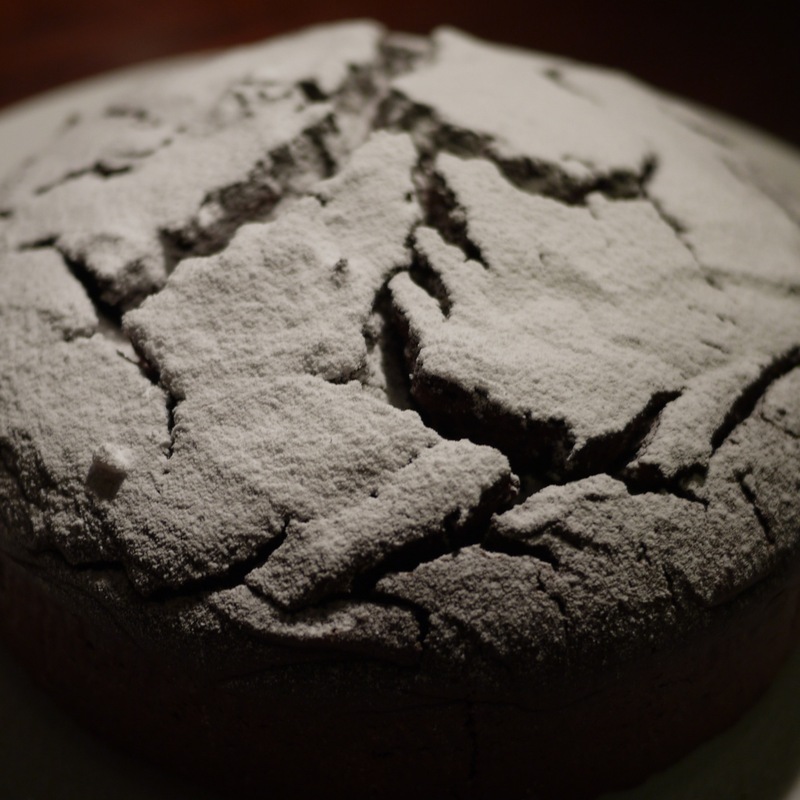 It’s great on toast, especially sourdough and can be used with chocolate cake (see below). 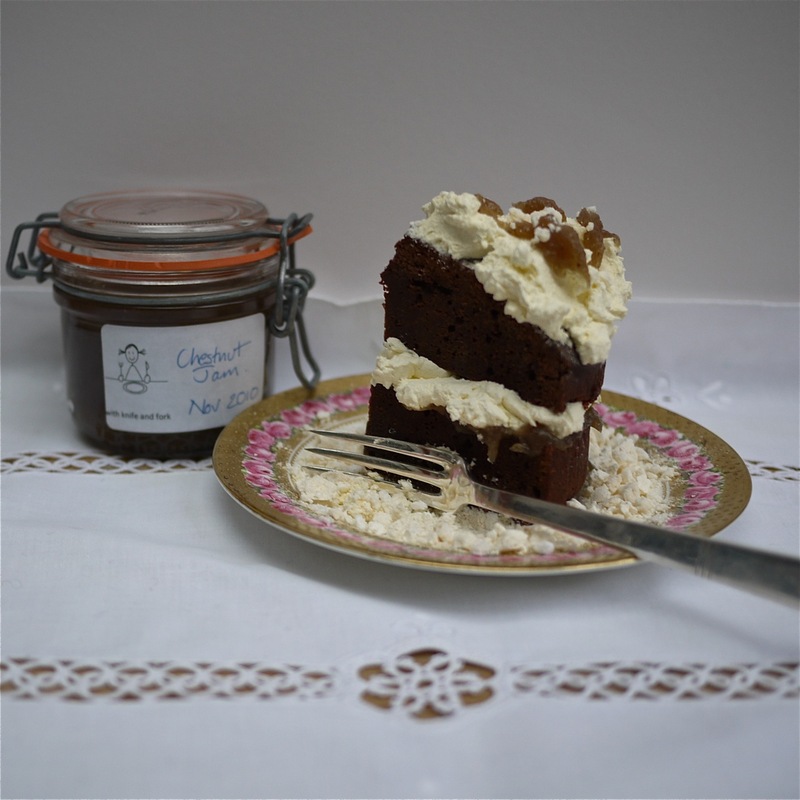 I was inspired by a whole range of ideas when I came up with this recipe: from Mont Blanc, various brownie recipes, Nesselrode pudding to a store cupboard cake of Nigella’s that uses jam or marmalade with chocolate….. Melt the butter in a bain-marie then add the cacao and allow this to melt and stir to mix as the cacao melts. Remove from heat and add the chestnut jam, mixing well, then add the sugar (if using) and eggs. When its all well combined add the flour a heaped tablespoonful at a time and mix. Pour into the cake or brownie tin and bake at R4 (180C) for at least 50 mins and a skewer comes out clean. My cake was very deep as it was in an 18cm tin and so it took and hour and half to bake, in a brownie tin it will take much less so start checking from 35 minutes and adjust cooking time accordingly. Leave in the tray/tin for 15 mins to cool and then remove. I served the cake sliced like a Victoria sponge and filled with more of the chestnut jam and whipped cream, topped with whipped cream and sprinkled with crushed meringues. As the cake was so deep this made it rather difficult to eat and it collapsed so I think doing it brownie style and topping with the jam, cream and meringues would be more effective.